We invite you to a special community showcase that highlights and celebrates the diverse work of our Tett Tuesday community! We are proud to present a group of talented, curious, and ambitious artists, students, crafters, and community members who have attended the Tett Tuesday Open Studio Program at the Tett Centre for Creativity & Learning this past year. On December 12th-19th, drop by the Tett Gallery and view and shop a selection of one-of-a-kind local goods, including: paintings, digital art, fibre art installations, knitwear, prints, drawings, embroidery, hand-dyed books and so much more! 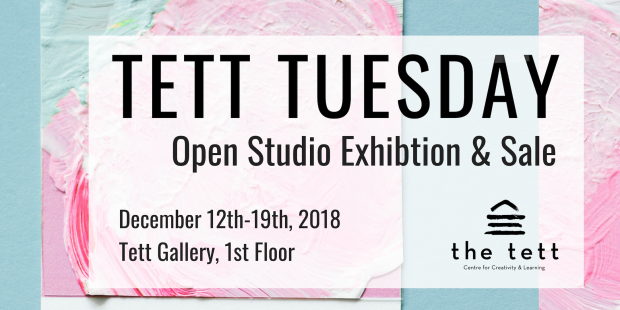 Tett Tuesday Open Studio is an opportunity to carve out time for monthly art-making, and it is a place to gather and work alongside aspiring, emerging, and professional artists and crafters in the Kingston community. It a space where inquisitive minds come together and flourish. Each month participants bring their own project and art materials and enjoy a relaxed and casual space to create and connect. Interested in joining our next open studio session? Join the fun! You can expect to meet a social, thriving, and like-minded community, enjoy free demonstrations, skill sharing, and a welcoming atmosphere, with full access our free studio space. © 2019 The Tett Centre for Creativity and Learning. All Rights Reserved.